Ringo Akai is only found in the PlayStation videogame that was released only in Japan. She is not part of the anime or manga series. Ringo doesn't have animal DNA, but she is able to transform into a Mew via a Mew aqua necklace that she got from her mother. Her mew animal is a Humboldt penguin, and she has an older brother named Mashio. She transforms into a Mew Mew after Kishu turns her pet penguin into a predasite. Ringo is Ichigo's cousin, and is 10 years old. 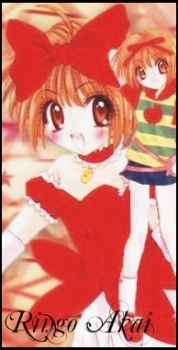 She actually does appear in the Petite Mew Mew manga sections of the Tokyo Mew Mew Series.